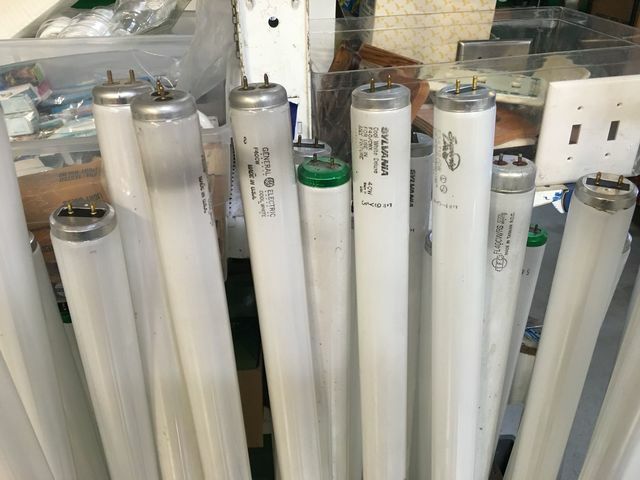 Lighting-Gallery-net - Fluorescent - T-12 and larger/ReStore now selling good ol' fluorescent stuff once again see the TFC and the old GEs? ReStore now selling good ol' fluorescent stuff once again see the TFC and the old GEs? More than happy they resumed! Was pissed when many ReStores stopped carrying old fluorescent. Those TFCs are real junk! I have some F15T8 TFC tubes, they seem ok, one of them has a crack in the glass but it still has a full vacuum and works. The ReStores here quit carrying fluorescents years ago. Because of that I don't go there very often anymore. Mine still does but not as often as before, but the guy that was turning tube donations away is gone now. The newer guy there knows I go there looking for tubes. the old guy that turned away tubes was the cause of my restore not having any good lights for a while. He was also the reason they had piles of old tube tvs, which they aren't supposed to accept at all. @Rick: The newest things you missed were some Norelco PARs (one dead) and a 1960's fluorescent desk lamp (loud ballast). Montclair is not all that bad. There, you can get pretty good deals on even the new stuff if it doesn't have a price. I got a box of 14 brand new Sylvania F15T8/CW for $2.40. @Gerard how often do you check out these restores? @Dave: Every Saturday (most of the time).